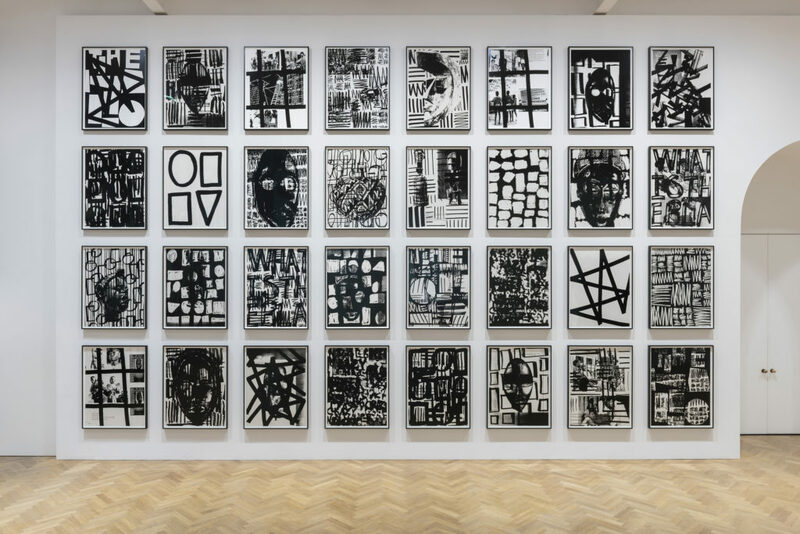 The solo exhibition of New York-based artist Adam Pendleton at Pace London showcases recent and new works spanning the gallery’s ground floor space. The works on view comprise of one mural piece, Wall Work, Midnight (A Victim of American Democracy) (2017) accompanied by several small System of Display works, four Untitled (A Victim of American Democracy) (2018) paintings, two silkscreen-ink-on-Mylar work groups titled Our Ideas #2 and #3 (both 2018), a small number of paper collages and one Black Dada painting and drawing. The video Just Back from Los Angeles: A Portrait of Yvonne Rainer (2016-17) is also displayed within a dark room installed at the center of the gallery. A poem titled Black Dada Nihilismus, found in Amiri Baraka’s book The Dead Lecturer (1964), inspired Pendleton for the conception of “Black Dada” back in 2008. Embarking from the diversity of the Dada movement, “Black Dada” embraces an idea reflecting upon the future while simultaneously referencing the past and exploring how art may purpose within the world we live in and embrace the realities we are surrounded with. Imbued with notions of blackness, societal turbulences, colonialism and decolonization, “Black Dada” has functioned since as the conceptual foundation of the artist’s oeuvre. Utilizing an array of techniques that he has been practicing for some time, Pendleton engages in a playful opus operandi involving collage, painted-over imagery, and transparencies. A great example for all this can be seen in Our Ideas #2 (2018) and #3 (2018), two constellations of works consisting of 36 and 32 parts each. Upon careful inspection, we observe a collection of images of African tribal masks (Chokwe, Punu, Dogon and so forth), other worship and ceremonial artifacts, as well as photographs of African people, all superscribed by naïve decorative patterns such as straight parallel lines, zigzags, and lettering. With a clear reference to institutional archiving, taxonomy and displaying practices of European and—in a broader context—Western museums, the artist challenges the potential ethical and social decharacterization of native populaces. He responds to the downgrading of such cultural items from being equal to a nation’s identity, to just being appreciated as museum objects of a certain artistic value, while they are kept inanimate behind a glass case. The two clusters of works emerge as the reimagination of an abstract and deconstructed cabinet of curiosities interrogating notions of displacement and post-colonial actualities. Adam Pendleton, Just Back from Los Angeles: A Portrait of Yvonne Rainer, 2016-2017. Photo courtesy Damian Griffiths. In Just Back from Los Angeles: A Portrait of Yvonne Rainer (2016-17), Pendleton follows two other video portraits he created in the recent past; that of conceptual artist Lorraine O’Grady (Lorraine O’Grady: A Portrait, 2012) and that of Black Panther movement chief of staff, David Hilliard (My Education: A Portrait of David Hilliard, 2011-14), yet here the artist appears on camera too. 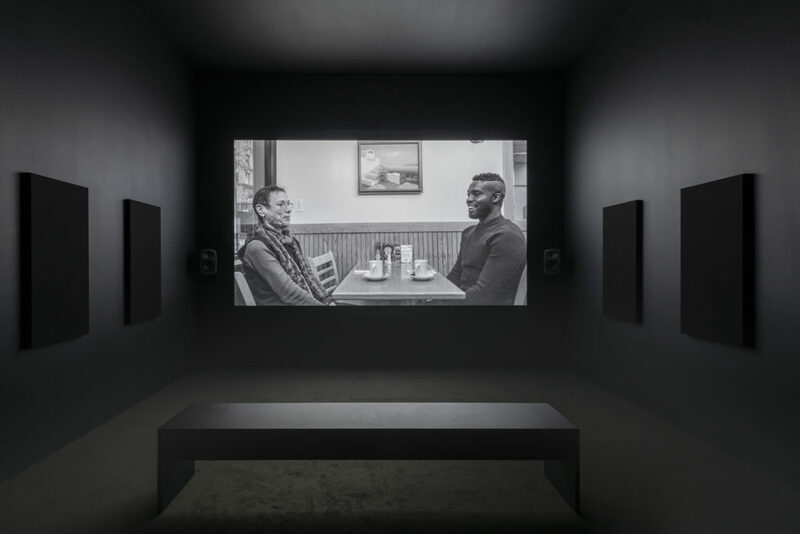 In the video shown during this exhibition, Pendleton meets Rainer for the first time at her favourite Chelsea diner in New York. They engage in a conversation based on their life experiences, unavoidably taking into account the age gap between them. At the same time, Pendleton provides a collection of texts for Rainer to read out loud, some of which are by Stokely Carmichael, Malcolm X, and Keeanga-Yamahtta Taylor. Issues surrounding identity, gender relations, social injustice and violence are brought to the table and the video ends with Rainer performing her arm drop routine; a praxis signifying trust and generosity as part of this temporary exchange. For some viewers, the visual language of Adam Pendleton might be somewhat opaque and impenetrable. The depth of his research and the plethora of the influences he has been subjected to despite his young age (34), construct a condensed, and perhaps, inaccessible conceptual platform. Yet, he succeeds in posing topical questions involving contemporary society and the way performance and effectiveness is perceived. He laboriously canvasses the genesis of ideas prompting us to explore whether this is the consequence of an individual process or the result of collectiveness. And while we are acquainted to a concealed manifesto on pressing issues, we progressively get to understand his convoluted mindset and depart having inherited an aftertaste of nowness and empathy. Adam Pendleton, Untitled, 2017; Untitled, 2017; Untitled, 2017; Untitled, 2017; Untitled, 2018. Photo courtesy Damian Griffiths. Adam Pendleton, Our Ideas at PACE Gallery London, UK runs through November 9, 2018. 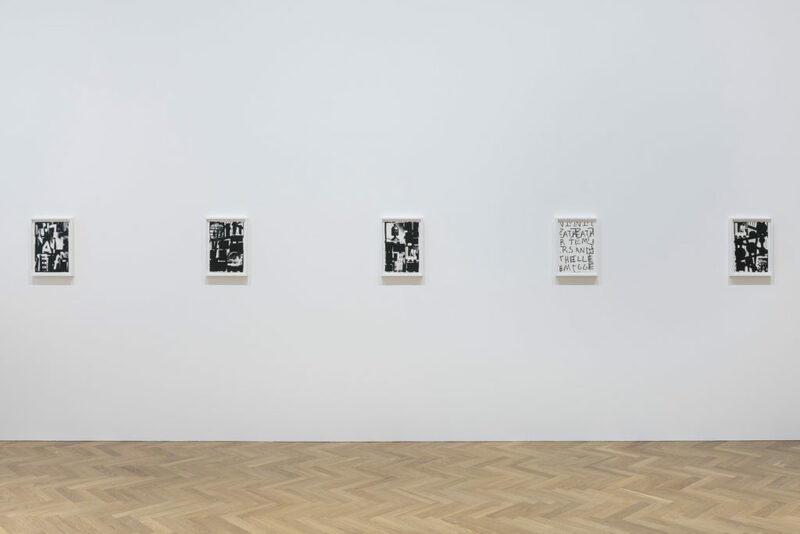 October 25, 2018 | Filed under Art Seen: International and tagged with Adam Pendleton, Kostas Prapoglou, PACE Gallery London.